Rock n’ Roll, burgers and shakes rule at the Corvette Diner! A '50s throw-back, with sassy waitresses in poodle skirts and bouffant hair-dos. It’s more than just a place to eat, it’s a destination. 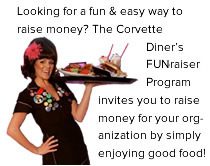 Celebrate Easter at the World Famous Corvette Diner, Sunday, April 21st. Visit us from 11am-2pm to enjoy Chef yummy brunch specials including Chicken and Waffles, Breakfast Burritos and more. Don’t forget to bring your Easter baskets! We will have Easter eggs hidden all over the diner for the kiddos to find from 11am – 2pm. Our regular menu will also be served from 11am – 9pm. For more information, please call 619-542-1476. To view the menu, click here. Treat Mom to burgers, fries and fun at the Corvette Diner! Sunday, May 12th we will be offering Mother’s Day Brunch Specials from 11am - 2pm showcasing Chef Daniel’s delicious Breakfast Burrito, Chicken & Waffles and more. Don’t forget to sip on $5 Mom Mimosas too! We will also be serving our regular menu from 11am - 9pm. For more information, please call 619-542-1476. To view our brunch specials, click here.